I really liked the part of Queen Victoria because she's humorous and very human," says Pauline Collins, who plays the march in this week's Doctor Who. "I'm sure she is both of these things in real life, but they're not the tributes you normally see in portrayals of her." The story sees our time yellers dropping into the Scottish Highlands in 1879, meeting Queen Victoria en route at Balmoral and, of course, encountering the werewolf reproduced on the previous page. I have to say, when I saw the episode, I was genuinely scared!" admits Collins. It's not the first time the actress has peared in Doctor Who. Almost 40 years she starred in the original series opposite trick Troughton. In fact, after her appearance as Samantha Briggs in the six-part story The Faceless Ones, she was offered a regular slot on the show. "I was offered 39 episodes as Patrick's sidekick in 1967," she explains. "I turned it down though, because it seemed such a long time to be tied to a series. I was frightened of feeling trapped. I really loved the danger of not knowing at was coming next. I still do." In this week's Doctor Who Confidential (Saturday BBC3) you can see the various parts of the filming process - from the computer effects and green screen glimpsed on the previous page, to the final horror of the werewolf on the prowl! "Pauline Collins was great fun to work with," says make-up designer Sheelagh Wells. "We found some photographs of Queen Victoria during a visit to Scotland and in this period her hair was in a fairly simple style, taken back into a bun. "The queen's carriage was escorted by her soldiers, so there was military research to do, too. The men's hair had to be the right length and we had to add facial hair - sideburns and moustaches - to set up the whole Victorian feel of the piece." But not everyone needed extra hair. A band of martial arts monks had to lose all of theirs. "The monks had to be hairless, so we had to shave people's heads," says Wells. "The actors were great about it. I had a team of people with me who looked after them and shaved their heads every day they came in. They looked stunning." APA 6th ed. : Hunt, Anna (2006-04-22). Royal prey. Radio Times p. 15. MLA 7th ed. : Hunt, Anna. "Royal prey." Radio Times [add city] 2006-04-22, 15. Print. Turabian: Hunt, Anna. "Royal prey." 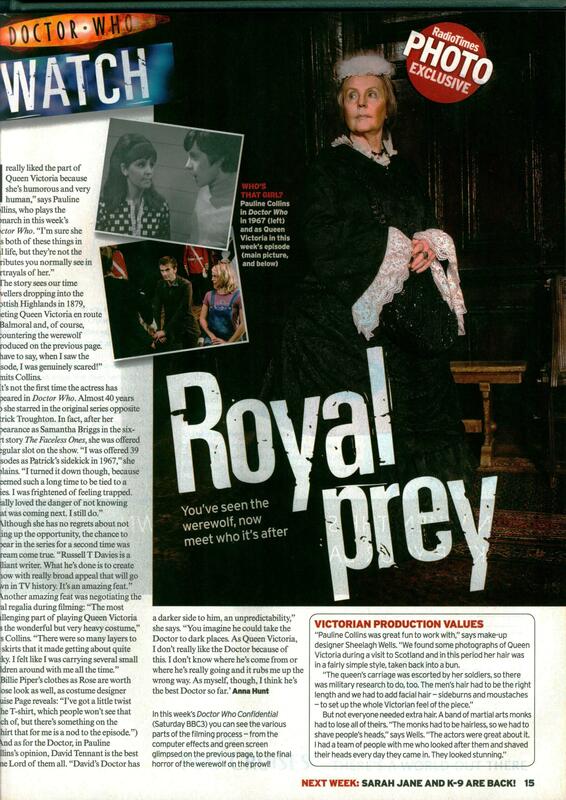 Radio Times, 2006-04-22, section, 15 edition. This page was last modified on 9 February 2014, at 14:57.